Great staff, wonderful welcome and introduction. Cleverly designed Bungalows. Pool welcome. Free bike hire (no booking required) - town only 2 kms away at most. Lots to see and do. Very relaxing, good value place. After a lovely welcome and introduction to our huge suite - sitting room, kitchen, shower room, large bedroom and enormous bathroom - we were treated to a welcome drink and freshly prepared banana pancake. The gardens are full of beautiful orchids creating a very calm atmosphere. The inclusive breakfast is freshly prepared to order and plentiful. Bicycle hire is free and if you want to venture further then scooters are available for about $7 a day - great for a day trip to the My Son temple site about 50km away. All of the staff were very helpful and knowledgeable with customer service a priority. 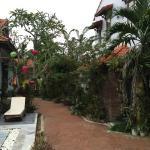 Highly recommended for a stay in Hoi An. We had a very enjoyable 3 night stay. We stayed in one of the double rooms and it was nice - very large for a double room. The first night we were there, we got in really late and they put us in one of the bungalows for the night - which was really large and could be great for a family. Only weird part was that the bathroom had an open wall leading out to a closed off little area (not big enough to sit in or anything, just an outdoor space). The staff were very helpful and had lots of great recommendations, breakfast was really good and one of the nights there, they invited us to a dinner (complimentary) for all their guests (we had prior plans). There was construction happening when we were there, but it didn't interrupt anything for our trip except it made the pool a little less inviting (which is kind of small anyway with just two lounge chairs). We would definitely recommend this place and stay here again. This was another amazing hotel we stayed at during a recent 2 week vacation. The staff was lovely, the breakfasts were awesome, and the fresh fruit was so cool. I really like that we were able to stay in a little bungalow style building, right next to the pool. It was the perfect size, and the perfect price for what we were looking for. The staff helped us find a few good restaurants in the area- The Cactus was very good- and also find a tailor that was top quality- BeBe. The rooms were nice, the outdoor shower/restroom was very cool to experience, coming from mostly north part of the USA, this concept is quite foreign to me. But it was enjoyable to take a hot shower on a cool night. I was surprised that the 'house' we were in had all the amenities. A fridge, a stove top, a filtered water dispenser, plates, glasses, and silverware. The bike, I have seen them discussed before on here, are def in need of some help, but they worked just fine for us the 2 days we used them. Only issue was a tire that blew out- but a quick change out was all it took to get back to fun. Overall great place, great staff, and great help in getting you anywhere and anything you need. 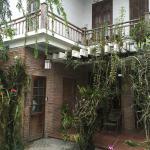 We stayed at Orchid Garden for 4 nights while in Hoi An. The hotel is perfectly located between the old town and the beach. The hotel provides bikes for free, which are perfect for exploring the area! We were able to book a cooking class and airport transfer through the front desk. The rooms were very spacious clean and comfortable. On our first night the hotel provided FREE dinner for the guests. IT was great to sit outside and chat with other hotel guests. The breakfast was also delicious! A very nice hotel with amazingly friendly service. A good location and great value. It is located between the old town center and the beach. Both are walkable, but they are substantial walks. Alternatively, you can catch a short and easy taxi ride. A taxi to the old town costs about USD $1.50. We always just gave them $2. We never waited more than a minute for a taxi to arrive. Rooms are large and comfortable. Air conditioned. The grounds are are beautiful and very peaceful. Breakfast is included and there is a good selection of western food or Vietnamese food. They offered a free dinner for all the guests on Monday night. It was delicious and highly recommended. The staff was very friendly and helpful. There are bicycles and scooters available at the hotel, although we did not use them.